Disclosure: General Hammond and the Pentagon are forced to reveal the existence of the Stargate to other world governments. 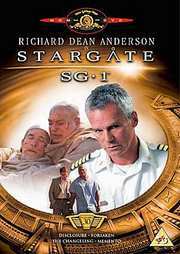 Playing off fears that the U.S. military has too much control, Senator Kinsey suggests that General Hammond be relieved of his command and that the civilian-run NID oversee the Stargate program. Forsaken: Exploring an off-world planet, SG-1 discovers a crashed ship and three human survivors who claim to be under constant attack by hostile aliens. While Carter helps repair the ship`s computer, she learns that the survivors are hiding a secret and things may not be all they seem. The Changeling: Teal`c mysteriously begins to lose his grip on reality and is haunted by visions of an alternate existence where he is a normal human being. As his paranoia deepens, Teal`c must rely on the help and comfort of his old friend Daniel Jackson to determine where his dreams end... and his reality begins. Memento: SG-1 accompanies the X-303 on its maiden voyage into deep space. When the ship suddenly drops out of hyperspace, SG-1 is stranded with no means of getting back to Earth. Their only option lies in exploring a nearby planet where a Stargate is thought to be located. But O`Neill must first convince its inhabitants that they come in peace - a debate that could mean the end of SG-1.